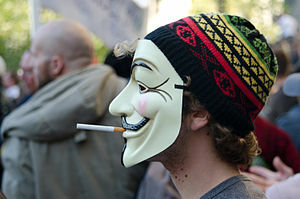 Word is spreading that Occupy Wall Street protestors are planning ‘global disruption’ for International Workers’ Day. Many will be wearing Guy Fawkes masks popularized by V for Vendetta, a movie so ridiculously awful that it remains the only one where I’ve walked out of the theatre halfway through. In that spirit, here are seven more movies from which Occupiers have drawn inspiration, and their not so great results. Occupy protestors slowly filled up every seat of the Caesars Palace poker room in Atlantic City. Once in place, they then took turns folding every hand to the big blind. Occupiers were thrilled to offer this example of everyone operating in a way that ensured financial equality, with no winner or losers. However, they made one embarrassing oversight, and had to leave after the casino had siphoned off all their money through the rake. So maybe there were losers, but at least everyone shared in the misery! Occupiers were inspired by Oakland A’s manager Billy Beane achieving success on a small budget through identification of market inefficiencies. They sat around for days trying to think up new, outside-the-box ways to efficiently distribute money across society. After hours upon hours of drawing blanks, they decided to call it quits after one member in a deep trance blurted out “I got it! Capitalism!” and another recommended hiring a Wall Street financial analyst as a consultant. The objective was to steal yachts from the wealthy and crash them into reefs, sinking them. But when they couldn’t figure out how to hotwire them, they instead co-opted some sailboats. Unfortunately, they were never able to gain enough speed to do any real damage, while many had no idea how to sail, forcing multiple Coast Guard rescues the next morning. Not sure if this one was purposeful, but many Occupy camps literally began to see dead people. Wanting to highlight the untapped potential and suppressed brilliance of society’s less fortunate, Occupiers took to prestigious universities across the country with the intention of solving complex mathematical equations on hallway chalkboards like main character Will Hunting. Unfortunately, being composed of Communications and Diversity Studies majors with no discernible skills, the best they could do was scribble some bad free verse poetry, with the actual janitors later correcting their spelling. Even though they laminated the fake subpoenas and mailed them first class, General Petraeus and Donald Rumsfield never showed up to Zuccotti Park so they could re-enact the dramatic Colonel Jessup courtroom scene. Occupiers ambushed and kidnapped a Wall Street CEO walking to the subway after work, shuffling him back to their encampment. After randomly inserting tangled IVs into their veins and iPod headphones into their ears, they all fell asleep, hoping to insert themselves into the CEO’s dreams and wreak havoc. And it actually worked!!! The only problem was that, once inside his subconscious, they learned that the CEO was a human being with normal hopes, dreams and fears. That he came from humble beginnings, and often spent Sunday mornings volunteering at a soup kitchen before church. Dejected by the realization that businessmen can have souls, they just waited an hour to wake from their nap and let him go. This entry was posted in Comedic Bias and tagged A Few Good Men, Good Will Hunting, Inception, Moneyball, Movies, Occupy Wall Street, Rounders, The Sixth Sense, Titanic by frack. Bookmark the permalink.